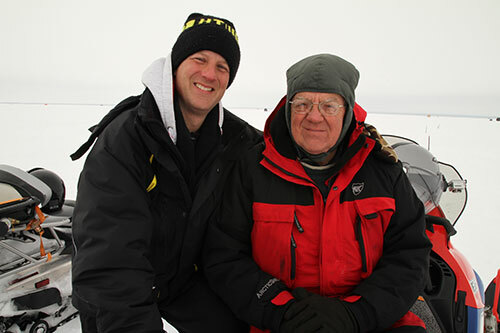 Tom Gruenwald, one of the true pioneers of the modern ice fishing movement, has been an avid ice fishing promoter for over 20 years. Tom works full-time for renowned ice tackle manufacturer HT Enterprises, developer of the famous /Polar Tip-Up/ and noted industry leader in modern ice fishing gear advancements, providing trusted, proven, innovative premium ice tackle to serious ice anglers for over 40 years. Read more about Tom. Watch Tom Gruenwald Outdoors Now! Regarding the tragic auto accident that has taken away two colleagues, mentors and friends…there are truly no words to describe my feelings right now…all I can say is this loss leaves a void in my heart and my life nothing else will ever fill. However, I treasure the times we shared, the laughs and all the precious memories — those are things that can never be taken away. Not a day will go by, not a fish will be caught or iced without me thinking of you. As Paul often said, “Thanks for everything.” Love you both!